Who Was Hit The Hardest During Last Week's Market Rout? While we previously reported that quant and hedge funds who were over-exposed to momentum and growth factors and stocks, as well as "hedge fund darling" names were hit especially hard during last week's rout, which saw a violent rotation out of "growth" and into "value" stocks, a deeper dive into factors and sensitivities indicated that beta, GDP sensitivity, and momentum were especially challenged during the recent pullback, based on an analysis of month-to-date performance through Oct 11 conducted by Bank of America. Among macro exposures, GDP sensitivity and nominal interest rates sensitivity were among the most significant factors explaining performance, as both highly cyclical and rate-sensitive stocks underperformed most in BofA's screens. Whereas overall leverage was not penalized, having floating rate debt - which is set to rise alongside the Fed Funds rate - was, with the top 25 companies by high floating rate debt as a percentage of market cap underperformed the S&P 500 by 2.2ppt, with nearly 70% of those stocks down more than the market. Looking at who was impacted the most, BofA found that large cap active managers' darlings were hit the hardest - the top 50 stocks most overweight by active funds declined 8.9% during the sell-off (as of Oct 11), lagging the equal-weighted S&P 500 index by 2.4ppt, while the top 50 most underowned stocks were unchanged. Incidentally, last Tuesday - just before the rout hit - we laid out a list of the "Top 20 Hedge Fund Long And Short Positions" in which we said that "the best performing strategy in the market has been also the simplest one: buying the most underweight stocks by large cap active funds and selling the most overweight stocks by large cap active funds has consistently generated alpha." Just two days later, anyone who had pursued this strategy was not only insulated from the rout, but generated substantial alpha. As for the internals of the market heading into and during last week's rout, growth stocks had led all other factor groups YTD through Sept., (+12.4%), as Value lagged (+4.3%). But during the sell-off, Growth factors proved one of the weakest links with a 7.2% decline (on avg. ), lagging Value by 0.8ppt. Growth vs.
Perhaps the most notable move during last week's rout is that value saw the biggest week-over-week reversal in nearly a decade, as Russell 1000 Value outperformed Growth by 2.4% in the week of Oct 1, reversing the Growth outperformance over Value (also by 2.4%) during the prior week. ... and is now up +1.6% as of Oct 11. High Beta, a Risk factor, also suffered from the pullback (-9.7%), lagging the equal-weighted S&P 500 by 3.1ppt. 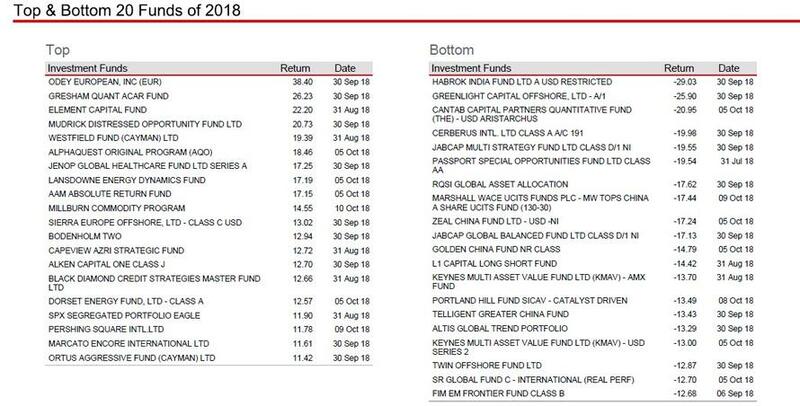 Finally, for those asking which hedge funds are doing the best - and worst - in the current environment, here are the Top 20 best and worst performing hedge funds of 2018 via HSBC, where we find, among other things, that after years of pain, Odey is once again leading the pack.